NFL Week 10 power rankings: The Rams finally lost, so who's No. 1? Since an inauspicious start to the season that included a home loss to the Buccaneers and a narrow victory over the hapless Browns, the Saints have been a prosperous team, with six straight wins against the spread. Since an inauspicious start to the season that included a home loss to the Buccaneers and a narrow victory over the hapless Browns, the Saints have been a prosperous team, with six straight wins against the spread. They beat the previously undefeated Rams on Sunday, 45-35, [as two-point underdogs](https://www.betchicago.com/vegas-sports-books-hammered-nfl-sunday), and so, for the first time this season, Los Angeles is not the No. 1 team in [our weekly power rankings](https://www.betchicago.com/nfl-week-9-power-rankings-todd-gurley-rams). To me, there's very little difference between the top-4 teams in the rankings -- the Saints, Rams, Pats and Chiefs -- so we're going to do these rankings in a tiered format. Hopefully that'll make them more reader friendly and also give you a better sense of exactly where we feel teams stand. But before we get to the rankings, just a quick reminder to play our [Thursday Night Pro-Am Football Challenge](https://betchicago.chalkline.com/games/tnf-challenge?external_referrer=https%3A%2F%2Fwww.betchicago.com%2Fvegas-sports-books-hammered-nfl-sunday). All you have to do is correctly pick six questions pertaining to the Carolina-Pittsburgh NFL game and Wake Forest-North Carolina State college game. If you get all six right, you win a cool BetChicago prize pack. [__The putrid Bills offense was a perfect remedy for the Bears__](https://www.betchicago.com/bills-offense-remedy-bears-defense) ## NFL Week 10 power rankings *odds courtesy of the Westgate Las Vegas SuperBook as of Tuesday afternoon __The Favorites__ __1. 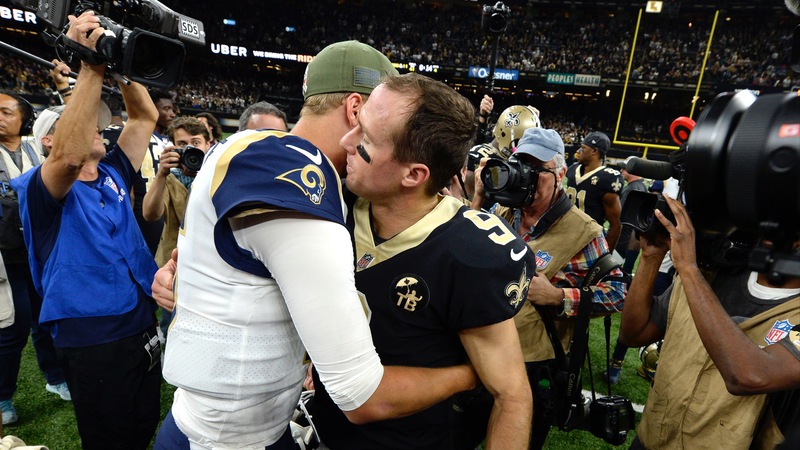 Saints (7-1; 6-2 ATS; 7/2 to win Super Bowl)__; [last week](https://www.betchicago.com/nfl-week-9-power-rankings-todd-gurley-rams): 4; -4.5 at Bengals -- They now own the longest winning streak in the league at seven in a row, including four by at least 10 points. But they face a very difficult second half, with only two games (at Dallas and at Tampa Bay) against teams with a losing record, and two against the Panthers. __2. Rams (8-1; 4-4-1 ATS; 5/2 to win Super Bowl)__; last week: 1; -10 vs. Seahawks -- They were bound to lose sooner or later, so it's probably better now so head coach Sean McVay can see how they respond to adversity. A division game against Seattle followed by a Monday night game in Mexico City against the Chiefs will provide a formidable test. Bet them at your own risk, as they're now on a 1-4-1 stretch against the spread. __3. Patriots (7-2; 6-3 ATS; 6/1 to win Super Bowl)__; last week: 2; -6.5 at Titans -- They've won six straight, and the only one they failed to cover was a 43-40 win over the Chiefs as 3.5-point favorites. During the win streak, their wins have combined by an average of more than two touchdowns. Expect them to be some more easy wins in their future with two games against the Jets (3-6) and another against the Bills (2-7) still to come. __4. Chiefs (8-1; 8-1 ATS; 9/2 to win Super Bowl)__; last week: 3; -16.5 vs. Cardinals -- Sunday's game against Arizona will be their third straight game against a team with a losing record, and then after the Rams in Mexico City, they play in Oakland agaisnt the Raiders (1-7), so this is a bit of a light patch in their schedule. And that's generally been a good thing for bettors this season, as they have only one loss against the spread, a 30-23 win at home ot the Broncos two weeks ago as a 9-point favorite. They've also scored 327 points, and no other team has reached the 300-point mark. __Championship Contenders__ __5. Panthers (6-2; 5-3 ATS; 25/1 to win Super Bowl)__; last week: 5; +4 at Steelers (Thursday) -- They've won three straight SU and ATS, including the last two by two touchdowns, but now they head out on the road for four of their next five games, where they are just 1-2 SU and ATS this season. The win was an improbable 17-point comeback in Philadelphia, where they scored 21 unanswered points in the fourth quarter. __6. Chargers (6-2; 4-4 ATS; 14/1 to win Super Bowl)__; last week: 6; [-10 at Raiders](https://www.betchicago.com/nfl-survivor-picks-week-10-jon-gruden-raiders-chargers) -- Impressive road win in Seattle on Sunday, and now they get three very winnable games (at Oakland and then home vs. Denver and Arizona) before three against teams with a winning record, in Pittsburgh (5-2-1), home against the Bengals (5-3) and at the Chiefs (8-1). __7. Steelers (5-2-1; 5-3 ATS; 12/1 to win Super Bowl)__; last week: 7; -4 vs. Panthers (Thursday) -- Four straight wins SU and ATS have put them right back in the thick of things in the AFC, right where the preseason prognostications anticipated. But with games against the Panthers, Chargers, Patriots, Saints and Bengals -- all winning teams -- still on the docket, winning the division is not a given despite a Week 6 victory over the Bengals in Cincinnati. __8. Texans (6-3; 4-5 ATS; 25/1 to win Super Bowl)__; last week: 10; BYE -- It takes a little luck to keep a win streak going, and Brandon McManus missing a 51-yard field goal that would've given the Broncos a victory was just that for Houston, which has won six straight after an 0-3 start. But of the six wins, only one (42-23 over the Dolphins) was against a team currently with a winning record. __Playoff Contenders__ __9. Vikings (5-3-1; 5-3-1 ATS; 16/1 to win Super Bowl)__; last week: 12; BYE -- Another team that's righted the ship after a rough start (1-2-1), they have won four of their last five SU and ATS heading into their bye week. They better rest up because their last seven games are a gauntlet -- two with the Bears, home for the Packers, at Patriots, at Seahawks, home for the Dolphins and at Lions. __10. Bengals (5-3; 4-4 ATS; 60/1 to win Super Bowl)__; last week: 9; +4.5 vs. Saints -- They had a negative point differential in the first half (-16) despite a winning record, and they could easily drop their next two coming out of their bye week (home against the Saints and then a trip to Baltimore). __11. Bears (5-3; 5-3 ATS; [40/1 to win Super Bowl](https://www.betchicago.com/super-bowl-53-odds-update-bears-futures))__; last week: 15; [-6.5 vs. Lions](https://www.betchicago.com/nfl-week-10-opening-lines-bears-lions) -- None of the five teams they've beaten currently has a winning record (combined record: 14-28) and they've only played one division game, so there's plenty of work left for them to secure their first playoff berth since 2010. __12. Falcons (4-4; 3-5 ATS; 80/1 to win Super Bowl)__; last week: 17; -4 at Browns -- It's going to be a difficult road for them to make the playoffs after a 1-4 start, but they've looked great back to .500, including a win in Washington, when even Julio Jones got into the end zone. This week in Cleveland is a must-win with road games agains the Saints, Packers and Panthers still to come. __13. Redskins (5-3; 5-3 ATS; 40/1 to win Super Bowl)__; last week: 8; +3 at Bucs -- Here's all you need to know about the NFC East: Its best team is ranked 13th in the rankings this week and is an underdog playing against a 3-5 team. Ouch. __14. Packers (3-4-1; 3-5 ATS; 40/1 to win Super Bowl)__; last week: 11; -9.5 vs. Dolphins -- Another one we don't need to talk much about. With Aaron Rodgers they have a chance against anyone, but if they don't win at least six of their last eight, they can kiss the playoffs goodbye. __15. Eagles (4-4; 3-5 ATS; 20/1 to win Super Bowl)__; last week: 14; -6.5 vs. Cowboys (Sunday night) -- It's always nice to gain in the division race while sitting at home doing nothing. They'll likely be an underdog for the first time this season next week in New Orleans. __16. Ravens (4-5; 4-5 ATS; 100/1 to win Super Bowl)__; last week: 13; BYE -- Things were looking so promising at 4-2, but three straight losses (SU and ATS), albeit against good teams (Saints, Panthers, Steelers) have their playoff chances living on a prayer. The UNDER has hit in six of their last seven games. __17. Seahawks (4-4; 4-3-1 ATS; 200/1 to win Super Bowl)__; last week: 16; +10 at Rams -- Here's all you need to know about Seattle: After they lost, despite being favored, at home against the Chargers on Sunday, their Super Bowl odds went from 80/1 last week to 200/1 this week. Still in the mix for a wild-card spot, but a tough schedule looms. __18. [Dolphins](https://www.betchicago.com/miami-dolphins-encourage-fans-to-vote-sports-gambling-amendment) (5-4; 5-4 ATS; 200/1 to win Super Bowl)__; last week: 19; +9.5 at Packers -- They stuck around another week after beating the Jets, and after this week they play the Colts and Bills, both winnable games. There's just very little margin of error for them with an offense that will likely be led by Brock Osweiler another week. __19. Titans (4-4; 5-3 ATS; 60/1 to win Super Bowl)__; last week: 21; +6.5 vs. Patriots -- Nice win [Monday night in Dallas](https://www.betchicago.com/titans-upset-cowboys-road-underdogs-betting-odds) to stop a three-game skid, but that 13-12 loss in Buffalo might loom large later in the season fighting for a wild-card spot. The good news for them is they're 2-0 against the AFC South without playing the Colts (3-5) yet. The UNDER had cashed in five of their seven games before Monday night. __Playoff Longshots__ __20. Lions (3-5; 5-3 ATS; 500/1 to win Super Bowl)__; last week: 18; +6.5 at Bears -- They've beat the Patriots, Packers and Dolphins, and lost to the Jets, 49ers and Cowboys. Strange season. __21. Cowboys (3-5; 3-5 ATS; 200/1 to win Super Bowl)__; last week: 20; +6.5 at Eagles (Sunday night) -- With their season down the drain, they might get embarrassed in Philly this weekend, and then it might mercifcully be time to say goodbye to Jason Garrett. __22. Jaguars (3-5; 3-5 ATS; 100/1 to win Super Bowl)__; last week: 22; +3 at Colts -- From the AFC Championship to an underdog in Indianapolis. How the mighty have fallen after four straight losses. __23. Colts (3-5; 4-4 ATS; 100/1 to win Super Bowl)__; last week: 25; -3 vs. Jags -- This loser of this game on Sunday joins the pit of misery. __24. Bucs (3-5; 4-4 ATS; 500/1 to win Super Bowl)__; last week: 23; -3 vs. Redskins -- Public bettors are loving that the OVER has hit in all but one of their games. [__The Pit Of Misery__](https://www.youtube.com/watch?v=I2MOimXE69s) (in alphabetical order). (Two new additions this week: Jets and Broncos). __Bills (2-7; 3-6 ATS; 10000/1 to win Super Bowl)__; last week: NR; +7 at Jets -- They've scored 20 points ... combined ... in the last three games. __Broncos (3-5; 3-5-1 ATS; 2000/1 to win Super Bowl)__; last week: 26; BYE -- One lousy field goal stood between them and a win ... and four straight covers. __Browns (2-6-1; 5-4 ATS; 10000/1 to win Super Bowl)__; last week: NR; +4 vs. Falcons -- This defense is getting progressively worse, expect Atlanta to smoke 'em Sunday. __Cardinals (2-6; 4-4 ATS; 10000/1 to win Super Bowl)__; last week: NR; +16.5 at Chiefs -- Biggest spread of the season, how fun! __49ers (2-7; 3-6 ATS; 10000/1 to win Super Bowl)__; last week: NR; -3 vs. Giants (Monday) -- What's worse, this game over Bills-Jets? I'll say this one just because it's in primetime. __Giants (1-7; 3-5 ATS; 2000/1 to win Super Bowl)__; last week: NR; +3 at 49ers (Monday) -- I almost forgot they were in the NFL last week. It was an odd calm. __Jets (3-6; 3-6 ATS; 2000/1 to win Super Bowl)__; last week: 24; -7 vs. Bills -- Is there any conceivable way you'd [lay a touchdown on them](https://footballmaven.io/jets/news/the-jets-are-massive-favorites-for-sunday-s-game-against-the-bills-VP42HbbYl0CSZzphlLZDYA/)? Oh, Nathan Peterman is on the phone? OK, hold on just a second. __Raiders (1-7; 2-6 ATS; 10000/1 to win Super Bowl)__; last week: NR; +10 vs. Chargrs -- I bet on them Thursday night. And I wasn't on drugs. I have no explanation.